February 19, 2015 - New York Attorney General Eric Schneiderman announced the filing of a multimillion-dollar lawsuit alleging that United Parcel Service, Inc. unlawfully shipped over 136 million contraband cigarettes or nearly 700,000 untaxed cartons across New York State in violation of federal and state laws. The lawsuit was jointly filed in federal court in Manhattan by the State of New York and City of New York. “Our lawsuit alleges that UPS blatantly disregarded New York and federal tax and public health laws, by shipping tens of millions of cheap, untaxed cigarettes to New Yorkers,” said Attorney General Schneiderman. "UPS has deliberately turned a blind eye to the fact that millions of dollars’ worth of untaxed cigarettes are shipped each year through its facilities, as outlined in our complaint,” said New York City Corporation Counsel Carter. “We allege that the entities that ship these cigarettes through UPS earn enormous profits by avoiding the payment of required taxes and that the fees collected by UPS to ship these untaxed cigarettes are paid out of these illegal profits. Today's action is intended to take the profit out of this enterprise for UPS and to seek penalties sufficient to discourage other common carriers from facilitating the illegal sale and delivery of untaxed cigarettes." The joint complaint against UPS alleges that, between at least 2010 and 2014, the company made more than 78,500 illegal shipments of cigarettes to consumers and other unauthorized recipients in New York State, amounting to over 683,000 cartons of untaxed cigarettes and a direct tax loss to the state and city of over $29.7 million and $4.7 million, respectively. The lawsuit maintains that the shipments were in clear violation of both federal and state laws, as well as a settlement UPS entered into with the New York State Attorney General’s Office in 2005, in which UPS agreed to cease all cigarette deliveries to unauthorized recipients, such as residences and unlicensed dealers, both in New York and throughout the country. The lawsuit further alleges that the company engaged in a pattern of racketeering activity with various cigarette dealers to traffic contraband cigarettes in violation of the federal anti-racketeering statute. 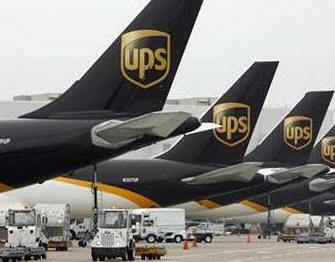 Of the total number of UPS deliveries in New York State, the complaint alleges that almost 36,000 went to addresses in the five boroughs and at least 70 were marked in UPS’s own records as having been handed to a child. Under New York law, it is illegal to sell cigarettes to minors. The joint investigation and lawsuit are based on subpoenaed UPS documents, which allegedly show that UPS made tens of thousands of shipments of cigarettes to New York consumers from unlicensed cigarette vendors located on Indian Reservations throughout the state. As outlined in the complaint, the shipments violated New York Public Health Law 1399-ll, which prohibits, among other things, direct shipment of cigarettes to homes or residences in the state. In addition, as these cigarettes allegedly did not bear New York State or New York City tax stamps, the shipments violated the federal Contraband Cigarette Trafficking Act (CCTA), which specifically prohibits shipments of more than 10,000 untaxed cigarettes in a jurisdiction where cigarette tax stamps are required by state or local law. The alleged shipments by UPS are also prohibited by the federal Prevent All Cigarette Trafficking (PACT) Act and by New York State tax law. With multiple violations of the federal CCTA, UPS engaged in a pattern of racketeering activity with the various cigarette dealers. Thus, the lawsuit maintains that New York State is entitled to treble damages under the federal Racketeer Influenced and Corrupt Organizations Act, also known as the RICO Act, amounting to over $89 million. The Assurance of Discontinuance agreement reached with UPS in 2005 provides that that company must pay the State a stipulated penalty of $1000 per violation, amounting to approximately $78.5 million. The complaint seeks damages and penalties totaling over $180 million. The UPS lawsuit is similar a $70 million joint suit filed against FedEx in 2014 for allegedly shipping illegal cigarettes to New Yorkers.